Ask fellow campers about "Mt. 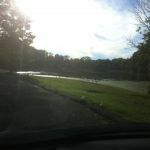 Gilead State Park" and nearby attractions. We stayed the two weeks allowed in this quaint little campground in order to visit with family 13 minutes away. The park was recently refurbished with a brand new bathhouse and laundry facilities. I like the way it was set up with private individual unisex showers on one side of the building and restrooms on the other. The laundry room had 2 brand new commercial size washers and dryers that cost $1.00 each. I used them several times and was quite pleased. We stayed in the upper section which has full hook ups. The sites are cement pads and what I would consider to be short. We had no trouble getting in because the park was empty when we arrived. However, two others had to back up all the way down the road to get out as there was no way to turn around when the sites were full. Parking of your vehicle had to be perpendicular and in front of your coach. The park was extremely quiet. There is a beautiful picnic and pavilion area where a wedding also took place. They have a breakfast fundraiser one Saturday a month which we missed. There's a horseshoe pit and other games the office has for use. The beautiful office/small store was also brand new. The lower section has electric only and waste water dump areas which we had never seen before. It consists of a big door on the ground that you lift and find a dirt pile where you would dump your gray water. The lower lake area was closed as they had just finished rebuilding of the new dam. We drove to the dam which also is beautiful. We were in a 30 foot travel trailer with a long bed truck. We fit OK, but would have had trouble had we had a larger unit. Sites on the left in the upper section were short and some very short. The sites in the lower section were larger and more private and more primitive without water or sewer hook up but beautiful. Buckeye pass will give Ohio residents a discount. Disappointed there was no discount for seniors. We will definitely stay here again. We camped at Mt. Gilead State Park in a Travel Trailer. 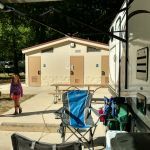 Nice small state park campground! The full hook up sites were a little close together but we had a pretty deep site by the bathrooms and older playground. There is a small new playground up by the office which was nice. We would stay here again. We camped at Mt. Gilead State Park in a Motorhome. Nice full hookup sites. Partial to full shade in all sites. Newer restrooms and shower facilities. Many of the trails are currently closed due to the construction on the dam. We camped at Mt. Gilead State Park in a Travel Trailer. Just outside Mt. Gilead, so shopping and dining were near. Private golf course across the road from the park. Twenty minutes from Marion, OH, where the President Harding Home and Memorial are located. Park is nice. Love the trails. Our site is a disaster. We are camping here for the Labor Day weekend. Shortly before we arrived, the new bathroom/shower/laundry facility was completed. Great news, except it's about 15-20 feet away from our camper. We're parked on a concrete slab, and the building sits right at the end of it. Naturally, everyone in the park is walking and biking straight through our campsite. DO NOT BOOK SITE 25. This should not be a site, period. We camped at Mt. Gilead State Park in a Travel Trailer. Again, I can't stress it enough. AVOID SITE #25 at all costs. This state park just recently added several back-in, full-hookup campsites with brand-new cement pads. I had plenty of room for my 32' motorhome and the hookups worked fine. The problem is that the grass is going to take a little time to recover so mud was a problem. Also, the lake has been temporarily drained to raise the dam 2', so if you want to fish or boat, you need to call to find out if the project is finished and the lake refilled. Overall, it is good to see improvements being made and the park should be very nice by next summer. Verizon service was adequate. We camped at Mt. Gilead State Park in a Motorhome. This park is setup for small campers. Sites are so close that we could not enjoy our stay. Not much to due here. The 2 lakes are more like lagoons. We camped at Mt. Gilead State Park in a Travel Trailer. Read books or watch tv. The park itself is fine. The grounds are neat and there is a playground for the kids, as well as fishing in the lake. But there is no running water anywhere in the park except at faucet at the back of the headquarters. There are no showers or flush toilets. The bird observatory is a joke. The feeders haven't been filled for along time. The toilets are all vault toilets and the buildings they are in are not the cleanest. We won't stay here again. We camped at Mt. Gilead State Park in a Travel Trailer. This is a very small State Park. It's very quiet and that's nice when you want to enjoy nature. And that's all you have here is nature, but don't get me wrong we like it. They have nice walking trails that meander around the small lake. I'm not sure kids would find this park very exciting there is no swimming, but I did see basketball courts and a very small playground. You can fish in the lake so that's nice for kids. So, it's not a park with tons to do, but the beauty makes up for that. We camped at Mt. Gilead State Park in a Motorhome. Are you affiliated with Mt. Gilead State Park ?